The first Marvel comic, with cover art by illustrator Frank R. Paul, was published in 1939. It is on display in the entrance to the exhibit at The Franklin Institute. Saturday, the long anticipated "Marvel: Universe of Super Heroes" will open at the Franklin Institute. The new exhibit, featuring original art by iconic artists such as Jack Kirby, Steve Ditko and Marie Severin, as well as costumes worn by Chadwick Boseman (Black Panther), Chris Hemsworth (Thor), Chris Evans (Captain America) and other stars from the Marvel movies, makes its Philadelphia debut during Marvel's 80th anniversary year. 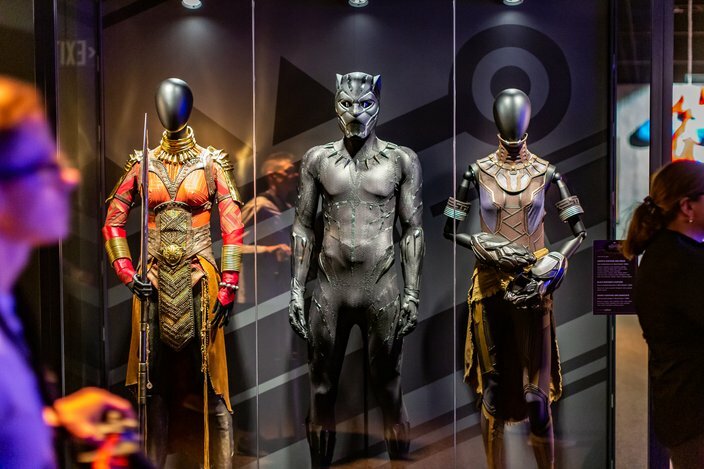 Costumes worn in the movie Black Panther are on display at the exhibit, Marvel: Universe of Super Heroes, at The Franklin Institute. During a preview on Friday afternoon, chief curator Ben Saunders shared the key highlights of the extensive exhibition. "The thing about this show is that I wanted to create an opportunity for people who have maybe 30 to 45 minutes to come through and just see a lot of cool stuff, and for people who have three hours or want to come back on more than one day to take a deep dive," said Saunders. 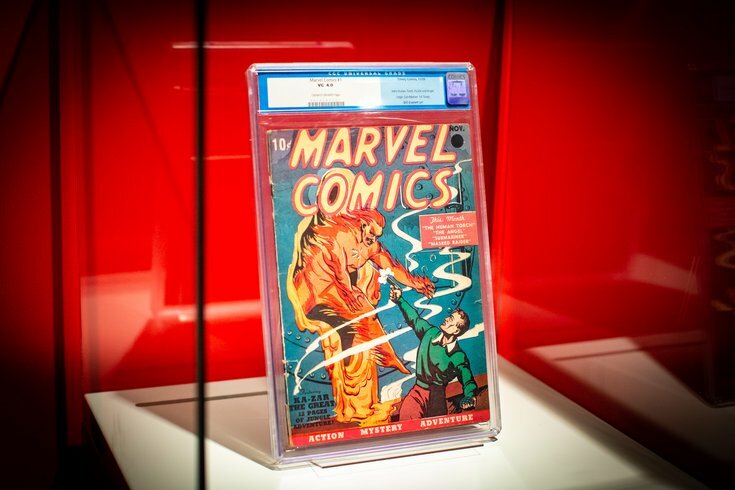 The exhibit, which begins with the origins of the Marvel Universe in the 1930s and moves through to the present day, is packed with objects from the past 80 years. 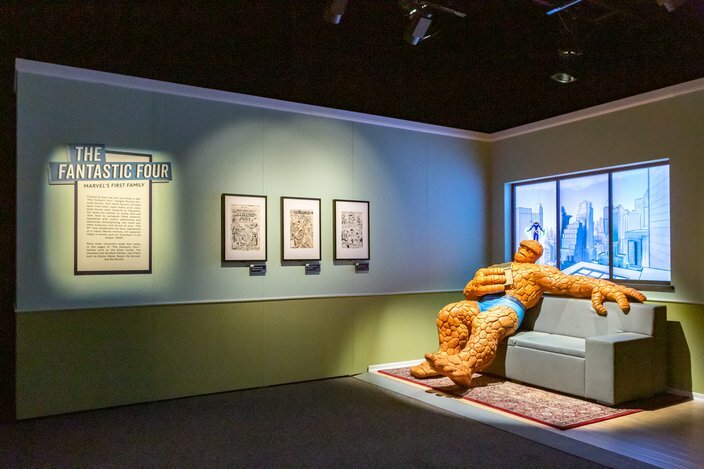 Visitors can have a seat next to The Thing from The Fantastic Four while visiting the exhibit, Marvel: Universe of Super Heroes, at The Franklin Institute. The "cool stuff" is the props and costumes, like Loki's helmet and Tom Holland's Spider-Man suit, the life-size sculptures of Hulk and the Thing you can pose with, the walk-through mirror dimension from "Doctor Strange," a Stan Lee memorial wall showing his many cameos and a specially-commissioned soundtrack that plays throughout the exhibit. 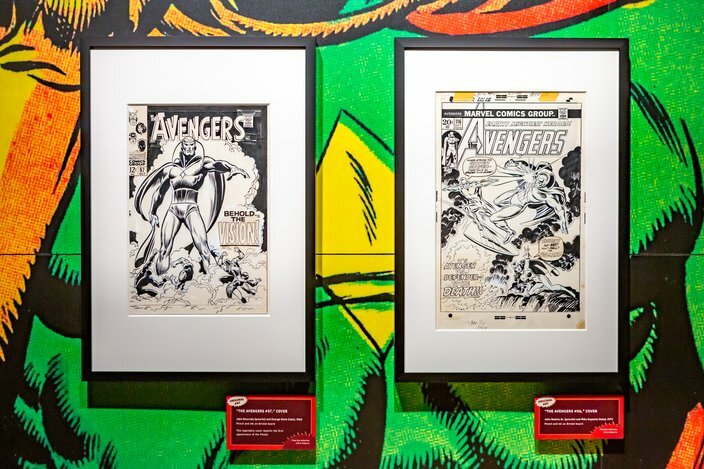 But what really makes this Marvel exhibit special is the hand-drawn images of Iron Man, the X-Men, Black Panther and the many other iconic superheroes. Two covers of original artwork from The Avengers comic book number 57 and 116. Looking at the very first image of Ant Man in costume created by Kirby, Saunders said, "This global-spanning fantasy franchise that is in everybody's brains begins with an individual working at a drawing board with a pencil and paper – that's where world-conquering stories begin. That's what I wanted to tell over and over and over again in this show." "You need the original art to do that. You can't do that with reproductions. You can't do that with just props. You've got to go to people's houses and beg them to let you borrow this work so that the public can see it, because it's all in private hands now," he continued. The Spider-Man suit worn by Tom Holland as Peter Parker in “Spider-Man: Homecoming” (2017). "Actually, getting the objects from the movies is not the hard part, because [Marvel] knows where all of it is, the hard part is finding the art." Original art in the exhibit includes the very first Marvel comic, the Incredible Hulk #102 cover, the X-Men #1 page and the Invincible Iron Man #128 cover. "If the medium in which you work is about reproduction, if the art most people have seen is actually printed copy, then the material from which those printed copies are produced is called original art," Saunders explained. 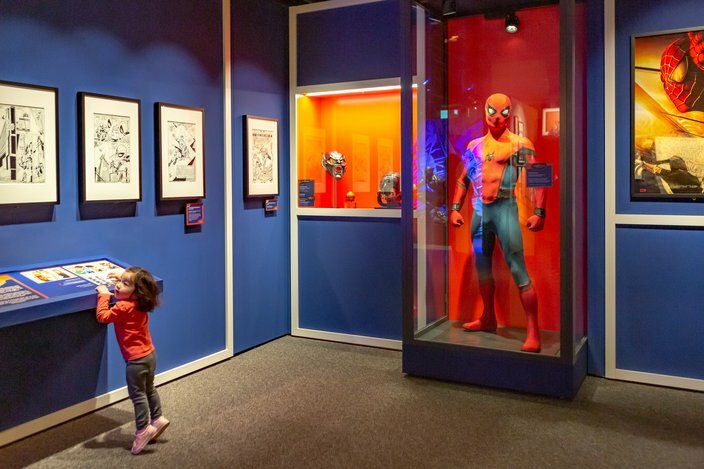 And for visitors who really want to dive into how these iconic superhero comics were produced, three "studio spaces" within the exhibit include interactive screens providing insight into the process. From casual to devoted, the new exhibit is for every type of fan. Through the 15,000-square-foot space, visitors will explore and celebrate Marvel's cultural impact. "Marvel: Universe of Super Heroes" will officially open Saturday, April 13. Tickets can be purchased here. The exhibit will be open through Labor Day. The Franklin Institute is located at 222 N. 20th St., Philadelphia, PA 19103.